Delightful subtle beauty, grace, nobility of origin and gentle voice forever captivated the great artist of Russian origin, Svyatoslav Roerich. 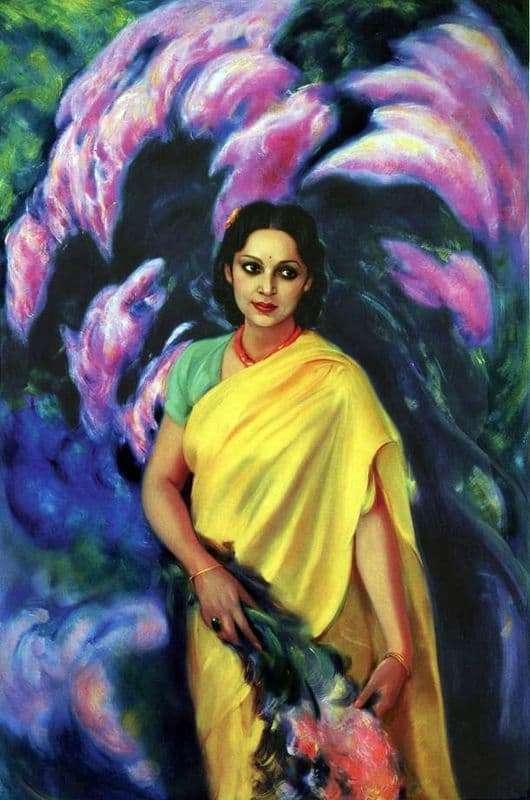 Subsequently, in 1945, Devika Rani (Rani is a pseudonym) agrees to become the wife and muse of the famous master. She was a famous and revered Indian actress. The beginning of the formation of a future career takes place while studying in England, the Academy of Dramatic Arts, and then takes up the study of the art of make-up and design on textiles in one of the famous artistic studios finishes courses in applied arts. There, in London, she met the film director Himanshu, who saw the future actress in Devika, and was attracted to act in one tape. The film brought her fame and world fame. However, after a while the death overtakes the spouse, and Devika has to deal with the release of films. Just for one of these ribbons, it was necessary to make decorations, and then fate confronts her with Svyatoslav Roerich. Two soul mates found each other, and unwittingly, fell in love with the first days of communication. The wedding took place in 1945, in the Kulu Valley. For him, she became a muse and companion in all his affairs. This portrait was painted in oil, autumn – a year after the wedding. He is permeated with tenderness of feelings and depth of emotions. He won the charming femininity and thin pure soul of the actress. On his canvases he depicted her, often with flowers in his hands. Her thin, graceful fingers with air weightlessness barely touched the petals, and he really felt that she was gently touching the artist. The mixing of the colors palette emphasized the whole natural beauty of the woman, giving the appearance of lyricism and combining the features of the world art of portraiture and Indian art.